[US] Administration officials wishfully see Hezbollah as analogous to Sinn Fein, the socialist “political wing” of the Irish Republican Army. But the IRA is (sic) a terrorist organization of comparatively modest, parochial ambitions (and far more modest capabilities). It has a single real enemy, Britain, and it wasn’t trying to destroy Britain — just eject it from Ireland. 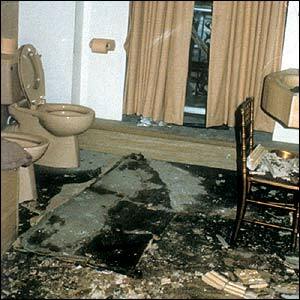 Above, Maggie Thatcher's bathroom at the Grand Hotel in Brighton in 1984 following the IRA bomb attack on the hotel, in which most of the British Cabinet were staying. As long as people don't panic. PRIME MINISTER GILLARD: No, it’s about 20 percent less in size than America. But 20 million people, 20 percent less in size. So that’s worth knowing. Who knows anything about Australian-rules football? PRIME MINISTER GILLARD: You do? Q I’ve watched a little bit. PRIME MINISTER GILLARD: You’ve watched a little bit? And what do you think? Pretty tough guy? PRIME MINISTER GILLARD: Okay. I’ve been trying to describe it to the President. It can be a bit hard to understand. PRESIDENT OBAMA: She brought me an Australian football. She was kicking it in my office. (Laughter.) Almost broke a bust of Lincoln. It was really -- (laughter.) That’s not true, guys. Just making that up. Witnesses said that when the men's bags were checked they were found to contain arms, ammunition, explosives, maps and passports from at least four different nationalities. Which other nationalities? We're not that far after the Israel/Dubai imbroglio. Yesterday, I accidentally scheduled a post that included Ryan Lizza's email to me rebutting my initial inference that he approved of Mark Leibovich's collecting other reporters' emails to political sources in order, presumably, to publish them. It's essentially college newspaper personality dynamics, but with a national platform. Incidentally, on that core point of Andrew publishing private e-mails to him without permission, there is that Glenda Gilmore e-mail from way back in 2002. A recollection that probably means we've been blogging too long. Not with the economy, but with ... Cricket! Beating England! Of course, everyone knows that real Irish sports fans would have nothing to do with a furrin game like cricket and instead only wish to follow Manchester United and their manager, Sir Alex Ferguson. Evidence outlined in a Pentagon contractor report suggests that financial subversion carried out by unknown parties, such as terrorists or hostile nations, contributed to the 2008 economic crash by covertly using vulnerabilities in the U.S. financial system. Suspects include financial enemies in Middle Eastern states, Islamic terrorists, hostile members of the Chinese military, or government and organized crime groups in Russia, Venezuela or Iran. Chinese military officials publicly have suggested using economic warfare against the U.S. It's strange the extent to which people will go not to believe in bubbles, even after we've been through a complete cycle of them.